Is a Solar Power System Right for Your Home? With the rise in solar energy micro-generation, many consumers are becoming interested in adding solar energy systems to their homes. However, a solar power system isn’t right for every home. There are many factors to take into consideration before jumping the gun and installing panels on your roof. It’s important to assess the pros and cons of home solar systems so you can determine whether or not it is an investment that will benefit you. Owning a home solar power system can protect you from potentially rising costs of energy, as well as increase the value of your home. Studies have shown that homes with solar power systems generally increase in value. A solar power system could also be a great selling point for a home. However, it is important that before even considering solar, you focus on home energy efficiency. Improving energy efficiency, alone, can save energy expenses. Then, after you’ve improved your home’s energy efficiency, a solar power system may be able to produce more than enough electricity for your home. Depending on what state you live in, your return on the solar power system can vary greatly. Different states offer different tax breaks for installing solar panels. On top of that, there are other incentives that are different in each state. For instance, some states may offer net metering, an agreement that if a home solar power system produces more electricity than it uses, the utility will purchase the extra energy at an agreed upon rate. However, not every state offers net metering, and even if it does, net metering can differ from utility to utility. Assessing the incentives and calculating the return on your solar power system is a great starting point if you are considering going solar. It is important to remain tied to the electricity grid regardless of whether your state offers net metering or similar incentives. There may be some months that your home solar power system doesn’t generate enough to power your home. Even sunny California can have a particularly rainy, overcast month that does not provide an ample amount of UV rays. While solar panels will still generate energy, there’s a chance it will not match what you use. In this event, if tied to the grid, you won’t be without lights – you can purchase electricity from the utility to make up the difference. If home solar is right for you – it’s a great investment, but it is not a small one. 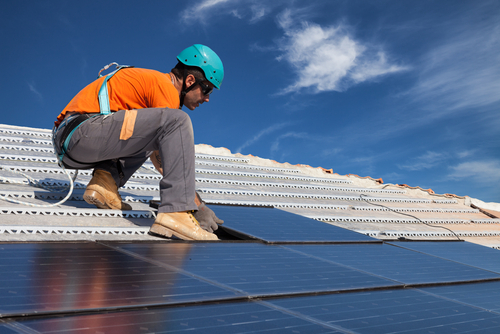 Be sure to assess your options; there are many ways to go about installing solar panels. If you don’t have thousands of dollars to pay out of pocket, or would prefer to avoid loans, there are companies that offer solar leases or Power Purchase Agreements (PPA). A solar lease is a flat rate each month – you’re paying rent for the panels. With a lease, you get to reap the benefits of home solar for a set price every month. A PPA is similar to the lease in that you do not own the panels but instead of paying a flat rate, you purchase the electricity they generate, typically at a fixed rate. Making the decision: Are solar panels right for your home? Don’t decide to install home solar panels until you have a thorough understanding of the pros and cons, which vary from home to home. Do your homework and make an educated decision. When it comes down to it, if right for your home, a solar power system is a wonderful, clean energy, money-saving alternative to relying on utilities and electric companies for your power service. The bottom line is whether or not it’s right for your home.